I pride myself on having a pretty good memory. I can remember the slightest details of days past, the furthest I can remember is age three. 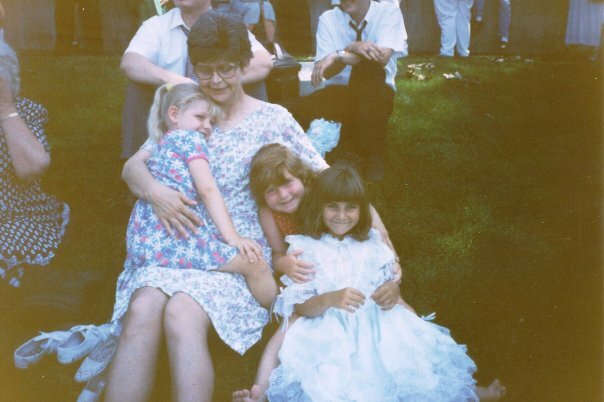 I remember dressing myself in a ruffled white tank top, which was a bit too small for me, but I forced it on anyway, because I remember how much I adored ruffles (and still do). I remember toddling around my Grama Barb’s driveway, very early in the morning. It must have been, because nobody else was awake yet, and the sky was half blue, half yellow. All of my good memories from that time were warm ones. I don’t remember ever having a good day in the snow. I remember the first time I realized, when it really struck me that seasons were changing. I felt a lurch in my heart, and looking back, I wonder if that was the first time I was truly disappointed in something. I was four, peeking around the heavy golden-stained drapes hanging in her living room, dressing that grand front window with all those little panes. I saw the red and orange leaves from the large trees in the neighbor’s yard blowing down the curb and in front of Grama’s house. I gazed up into the naked trees and hoped they wouldn’t catch cold. Even then, I like to think I had a compassionate heart. There was a vacant lot across the street, sitting on the corner. It was a perfect lot to play in, with a berry bush and a small hole in which to squish things with a small stick. The kids across the street lived adjacent to this lot and on one particular afternoon, we were pretending to mix magic potions with our berries and a few sorry ladybugs (because ladybugs are good luck, of course) as a storm brewed above our heads. As the first crack of thunder pounded our ears, the rain came spattering down in great exaggerated drops. Grama Barb hollered for us from the porch and we darted across the street, barely making it to the house before a flash and a bang left us in the dark. At three in the afternoon, my cousins and I played flashlight tag in the front room while Grama prayed in the kitchen that the roof wouldn’t blow away. Even after they divorced, my father’s parents remained civil, as cooperative as they had ever been. My grandfather was a regular face at random family gatherings, sometimes pitching in to cook burgers on the grill for an impromptu dinner, or to stop by with some baked treats from Birney’s, the best bakery in the South End. We didn’t venture down there; that was his territory, the ghetto in which he skulked around sometimes. We heard rumors and he told us stories of different people he had encountered, going on to marry a prostitute he had befriended as a prison penpal. He was a colorfully crooked French Canadian, to say the least. He ate onions like apples, not once flinching at the bitter taste.